Cruciferous vegetables, such as cauliflower, broccoli, cabbage and kale are rich in unique compounds shown to increase the body’s resistance to many forms of cancer. Crispy Cauliflower Steaks and Orange Tahini Dressing is an impressive dish, crispy around the edges with a juicy interior. Get the recipe here! This class of vegetables contains high levels of the antioxident sulforaphane. This distinctive phytonutrient activates natural detoxifying enzymes in the liver that help neutralize potentially carcinogenic (cancer-causing) agents. Many studies have found diets high in cruciferous vegetables are associated with a reduced risk of lung, colorectal,prostate and breast cancer. In one study, Canadian researchers found that consuming cauliflower conferred the strongest protective benefits when compared to other crucifers. Various: Brussels sprouts, Cabbage, Kale, Broccoli Sprouts, etc. 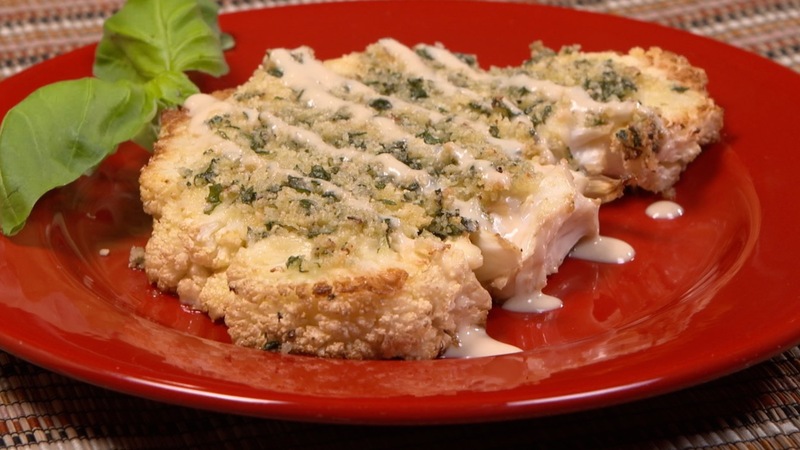 Cauliflower has been on trend for several years, with presentations from cauliflower rice to cauliflower pizza crust… and most recently, cauliflower steaks! Verhoeven DT, Goldbohm RA, van Poppel G, Verhagen H, van den Brandt PA. Epidemiological studies on brassica vegetables and cancer risk. Cancer Epidemiol Biomarkers Prev. 1996;5(9):733-748. Kirsh VA, Peters U, Mayne ST, Subar AF, Chatterjee N, Johnson CC, Hayes RB; Prostate, Lung, Colorectal and Ovarian Cancer Screening Trial. Prospective study of fruit and vegetable intake and risk of prostate cancer. J Natl Cancer Inst. 2007 Aug 1;99(15):1200-9. Epub 2007 Jul 24.